The Milwaukee County Zoo is pleased to announce its female baby gorilla, Zahra, has arrived at her new home today at the Columbus Zoo and Aquarium. 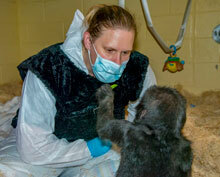 A recent photo of Zahra shows her interacting with one of the Milwaukee County Zoo keepers. She has participated in human-assisted rearing since April 28. Sadly, Zahra’s father, Cassius, passed away unexpectedly April 12, 2018, as did her mother, Naku, on April 28. Since then Zahra has participated in human-assisted rearing, as zookeepers were staying with her 24-hours per day, seven days a week. 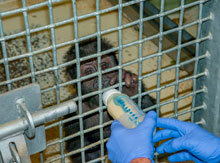 Zahra receives a bottle with formula from a MCZ keeper. “Intellectually, Zoo staff who have been caring for Zahra 24/7 know this is the right thing for her, at the right time, but it is bittersweet for many, as zookeepers and animal care staff have invested many hours in her care and her needs, both physical and emotional. We thank our keepers, visiting zoo professionals and the Milwaukee community for their continued support. The health and well-being of our animals is the first priority, and of the utmost concern, and our motivations and actions are always to that end,” added Wikenhauser. Zahra will be under 24/7 care by the Columbus Zoo's human-assisted rearing team until introductions with a potential surrogate mother begin. While the Zoo's animal care team will also take cues from Zahra to determine when she's ready to transition into each important phase, the goal is to place her with the surrogate as quickly as possible so she is soon with other gorillas. 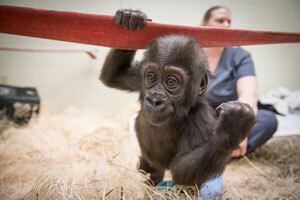 The Columbus Zoo and Aquarium has been a pioneer of gorilla surrogacy for more than 30 years. The Zoo has been recognized internationally for their care of gorillas in social groups, including expanding social groups through the placement of young gorillas with surrogate mothers. Over the years, nine gorillas born at the Columbus Zoo have been raised in the surrogacy program, and, including Zahra, an additional seven have been sent from other zoos. The Columbus Zoo has potential surrogate mothers in mind for Zahra; however the final decision regarding the surrogate mother selection will ultimately depend on the animals' behaviors once Zahra has been introduced. "There are many important details to consider in gorilla surrogacy, and we are proud to offer our animal care team's expertise, care, and commitment to ensure that Zahra's well-being continues to be top priority," said Columbus Zoo President/CEO Tom Stalf. "In addition to the great care the Milwaukee County Zoo team provided to Zahra and now our animal care team's assistance, the surrogate mother and her troop will have their own integral role. While Zahra has already experienced tough challenges in her young life, she is being placed in a caring environment where she can thrive physically and socially while also helping to contribute to the success story for the future of this incredible species that continues to face many threats in their native range," continued Stalf. The Milwaukee County Zoo's lead gorilla keeper, who accompanied Zahra, to make the transition as smooth as possible, will continue working with her at the Columbus Zoo for several more days. A second MCZ gorilla keeper travelled along with Zahra to the Columbus Zoo.